It’s an understatement to say that Fulham’s defence has been bad all season. 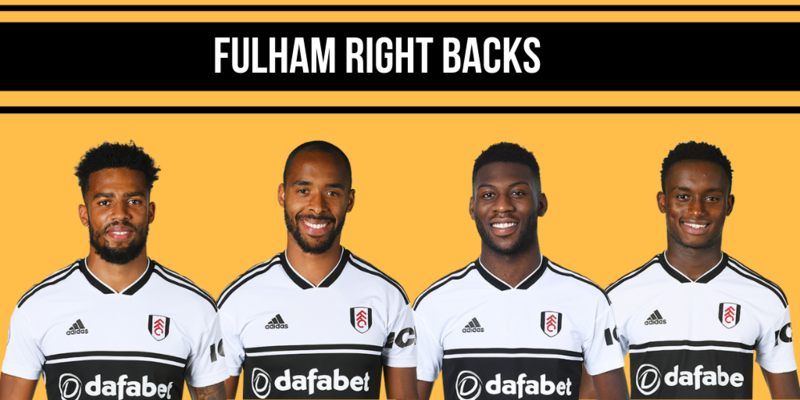 In particular, the right-back position has been a real weakness with many sides having success down Fulham’s right-hand side: 101 chances have been created down Fulham’s right flank in comparison to 77 on the left. Despite all the money spent, Fulham failed to replace Ryan Fredericks over two transfer windows. Timothy Fosou-Mensah, Denis Odoi and Cyrus Christie have all featured at Right back at some stage but none have been able to consistently put in good performances. Chrisite picked up an injury v Crystal Palace and Timothy Fosou-Mensah, whose loan Ranieri wanted to terminate is ineligible to face his parent club. That leaves young Steven Sessegnon to play at RB or moving Denis Odoi out to the right again. So which players will be marauding down Fulham’s right-hand side that would be worth looking at? Marcus Rashford started on the left in the last meeting between the two sides and bagged himself a goal and two assists. Martial missed out on that game through injury and after coming on as a sub in the last game for Alexis Sanchez could profit down Fulham’s right flank. Anderson has looked a class act for most of this season. He terrorised Dennis Odoi in the first half at Craven Cottage. 2-0 down at half time Ranieri had to bring on Cyrus Christie to try and deal with him. He bagged an assist in that game and looked extremely dangerous every time he went forward. West Ham also have nice fixtures over the next few game weeks and play Fulham in GW27 where there are a number of blanks and tricky fixtures. West Ham also don’t blank in 31 but may face a blank in 33. Redmond has seen an upturn in form under Hassenhuttl. He has played predominantly on the left although he has played at times further forwards in a more central position. Redmond is second for take-ons among defenders this season only behind Eden Hazard. Southampton have a mixed bag of fixtures but don’t blank in 27 or 33. We all know what Eden hazard can do on his day. He’s created the most chances and has more take-ons than any midfielder. Back on the left, if Hazard can form a partnership with Higuaín then this looks like a game where he could haul. After the blank in 27 and it may be worth bringing back the premium midfielder for the Fulham Game in GW29. No doubt most managers own Mohamed Salah but with clean sheets not as plentiful as they were before a switch to two Liverpool attackers could be an option and an easy move for those looking to offload Leroy Sane. Mane has picked up his form in recent weeks with a goal in each of his last three games. With no blanks for Liverpool, I suspect most managers will have the full quota of Liverpool assets. Mane might just be the one to fire you up the ranks. Sane Started in both the reverse fixture and the EFL cup on the left of City’s front three. If managers that placed the triple captain on him can give him another chance he may well go some way to repaying them. Bringing him back in for GW32 onwards for a nice run of fixtures of Fulham, Cardiff, Palace, Spurs, Burnley, Leicester, and Brighton. With City Likely to be battling for the league and the return of Mendy we will know if he will still be a regular starter.